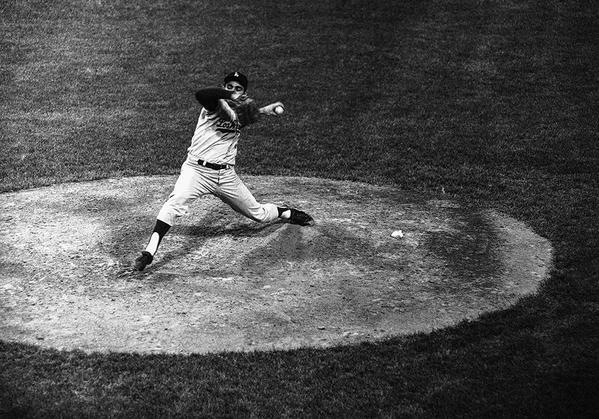 Today is the 51st anniversary of Sandy Koufax's third career no-hitter against the Phillies. He became only the second pitcher in the modern era to throw three no-no's - Bob Feller was the first. Photo above via @sportsphotos on twitter. Check out a new Dodger blog called "From Duke to Joc, All Things Dodgers" here. Via Eric Stephen at True Blue LA, "Paco Rodriguez MRI shows no new elbow damage." Via Mark Saxon at ESPN, "Joc Pederson's power continues to blossom." Via Cary Osborne at Dodger Insider, "A new voice for a critical 2015 Dodger draft." “The power of the group together and more minds is better than one mind,” (Billy Gasparino) said. “It worked every draft I’ve been a part of. The best drafts, the best outcomes have been a group reflection of the board and the players we take, not just one person. Via Mark Saxon at ESPN, "Mystery surrounds Kenley Jansen's absence." "I don't know who wants to talk about it. I'm not the one who wants to talk about it, though," said Mattingly, clearly perturbed. "He was unavailable." Panini will once again create special Father's Day cards that will be available at participating hobby stores, and they shared a bunch of pics online. Go here to check out a whole bunch of preview photos. Below are the Yasiel Puig, Clayton Kershaw and Joc Pederson cards.